Voltron: Legendary Defender’s sixth season was a whirlwind thanks to its unrelating twists and shocking reveals. It saw the return of both Keith and Shiro, the literal and figurative unmasking of several villains' plans, and gave audiences whole new sides of several key players before dramatically setting up a return to Earth. Easily the series best season yet, Season 6 delivered as many long-awaited answers as it did new questions. Here are nine of the biggest we have after watching Voltron's latest go. The Quintessence dimension nearly took out the paladins in their battle against Lotor, which is why it may seem safe to assume the latter is dead. But if Zarkon and Honerva are any indications, there is a chance that Lotor withstood the element’s physically altering properties and survived his loss against Voltron. Not to mention, Allura’s searing words – that Lotor had become just like Zarkon – felt like more than just an angry jab. They also had an ominous foreboding. So if (and when) Lotor comes back, what exactly will he be? And what will Team Voltron need to pull off to stop him? 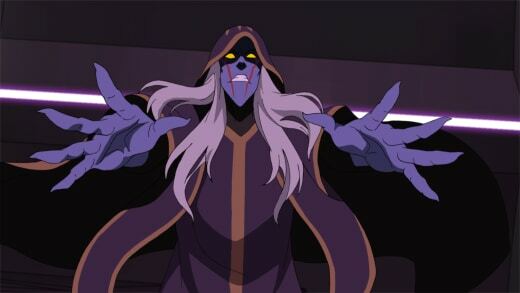 When Voltron: Legendary Defender introduced Lotor during Season 3, he came as a package deal, accompanied by his half-Galra generals: Acxa, Narti, Ezor, and Zethrid. While Lotor killed Narti in Season 4, an event that triggered a mutiny among his team, they briefly reunited again for Season 6. Unfortunately for Lotor, his plans to wipe the universe of the Galra were yet another move that didn't sit very well with his generals. In their last moments on screen during Season 6, we see Ezor, Zethrid, and Acxa attempt to flee their fight against the paladins. 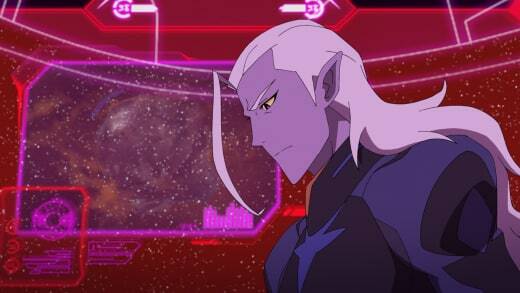 Angry at being abandoned again, Lotor ejects them from his ships before they fly off using their suites. But that can’t be the last we see of them in the series. Like Allura, they were close to Lotor and believers in his vision, if only for a time. What will they do with the knowledge of his plans? And what will Axca – the brains of the team and the most morally and loyally conflicted of Lotor’s generals – do if he returns to wipe out the Galra Empire? Haggar's spying through clone Shiro's arm allowed her to glimpse what the paladins were planning, learn about her son’s Altean planet, as well as discover Keith’s connection to the Blade. That "sight" was also apparently a two-way street, granting the clone the ability to see the witch's entrance into and return from Oriande, a trip that resulted in Haggar looking more like her old self than she had in 10,000 years. Why exactly did she go to Oriande though? It couldn't have just been about getting back into Lotor's good graces. And what about Shiro? Will he remember what his clone saw and be able to relay that to the rest of the team in time? As most fans know, characters in the series that have white hair tend to have an Altean connection or been touched in some way by quintessence. Lotor, Haggar/Honerva, Allura, and Alfor are all examples of characters who have this link, organic or acquired. After Allura removed Shiro’s soul from the Black Lion’s consciousness and planted it in the body of his clone, the black paladin’s hair went from featuring a white tuft in the front to completely snow white. Knowing what we know about other white-haired characters, is Shiro's new style just about yet another new hair-do for the black paladin or could it be something more? And if quintessence has the power to alter other characters, how might it have changed Shiro? 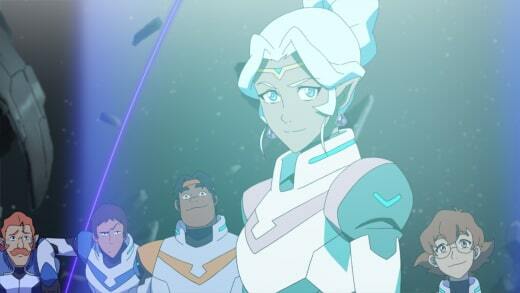 From the beginning, Allura’s been much different from the other members of Team Voltron. She’s taken Haggar one-on-one, single-handedly powered-up the Castle of Lions, and been one of the few able to pass through a magical dimension. That's not even counting what we saw from Season 6: Allura completing Shiro’s soul-transference and syncing up with Voltron to take out Lotor with a power quintessence ray. No one man should have all that power, but Allura is no man. So the question is, where does the Princess of Altea go from here? What other powers does she have up her sleeve? And what does that brief connection to the Black Lion mean? In addition, can she remain on Team Voltron as just a paladin, especially now that she knows she’s not one of the only two Alteans left in the entire universe? There were quite a lot of feelings being shared in Voltron: Legendary Defender's sixth season. Allura and Lotor managed a single kiss before the Galra Emperor’s secret plans were revealed and she broke it off. Then, in an epic battle to save his friend’s life, Keith confessed that he loved Shiro and wouldn’t leave him behind, even if it meant him dying, too. Perhaps a little less grand, but still potentially significant was Lance's own romantic dilemma. Unlike past seasons where Lance’s crush on Allura has mainly been childish jealousy, Season 6 saw him reveal his real feelings for the Pink Paladin to her mice. He also made extra efforts to support her emotionally and even took hits in battle for her. The show displayed a more mature side of Lance we often do not see. Could it be possible that Lance is finally ready to step (and grow) up a bit? And might that change the way Allura sees him? 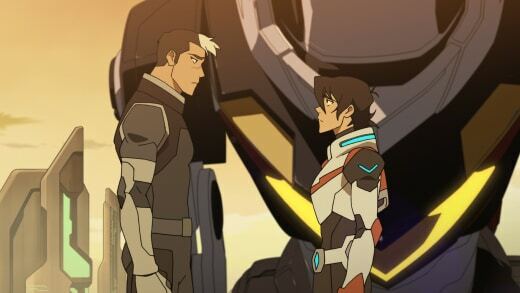 After Shiro’s disappearance at the end of Season 2, the Black Lion crowned Keith its new pilot. But Keith wasn’t ready, for many reasons, to take on the responsibility. That grow up (or glow up!) helped prepare him to head Voltron when clone Shiro was activated by Haggar. He was so good, in fact, he looked ready to succeed Shiro. There's just one small problem: Allura brought the real Shiro back to life. There can only be one Black Lion pilot, so who will be the one to serve as the head of Voltron? Planted throughout episodes past were hints about what would transpire in the latest seven. Shiro having clones, Lotor’s betrayal and Krolia being Keith’s mother are just a few of the things the show tried to tell us were coming. Which is why it seems silly to ignore the elephant in the room: the odd connection between Shiro and Keith’s father. Beyond Keith claiming Shiro has acted as a stand-in brother, Shiro has regularly appeared in (or interrupted?) flashbacks to Keith’s dad. Related: Get Comic Con HQ via Prime Video Channels to Stream Original Series, Past Comic-Con Panels & More! Their character designs are also quite similar, and at one point we learn the outfit Shiro regularly wears belongs to Keith’s father. Not to mention, Shiro’s Galran arm is the same arm as the one his father broke in a flashback. 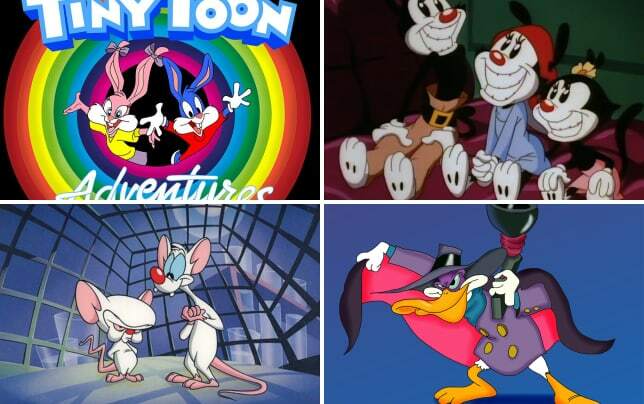 While you can easily explain it away by chance, it seems odd that the show would such specific parallels. So how deep might the connection between Shiro, Keith and Keith's father actually run? And how many more Shiro twists does Voltron have up its sleeve? After the Castle of Lions is destroyed closing a dimensional rift created by their battle with Lotor, the team and their lions need a new base. Pidge's father is offered up as the best shot at re-creating something similar and since he went back to Earth, they must go where he is. Will their visit be all business, or will the series take time to explore some of the character's familial backstories? How long will they spend there when so much of their job as defenders of the universe is in space? Most importantly, Season 6 revealed that the Galra have already been to Earth, so is it prepared to withstand a potential attack if they do decide to drop in? Abbey White is a staff writer for TV Fanatic. Follow her on Twitter.